Gillian G. Gaar is a music historian and journalist whose writing has appeared in Goldmine, Mojo, and Rolling Stone magazines, and a variety of other periodicals as well as the book The Beatles Digest and several Beatles anthologies. She is the author of several books, including She’s a Rebel: The History of Women in Rock & Roll. She lives in Seattle. 100 Things Beatles Fans Should Know & Do Before They Die was reviewed in the Raleigh News & Observer. 100 Things Beatles Fans Should Know & Do Before They Die was reviewed in American Profile. Gillian Gaar, author of 100 Things Beatles Fans Should Know & Do Before They Die, interviews live with the Rock Book Show. 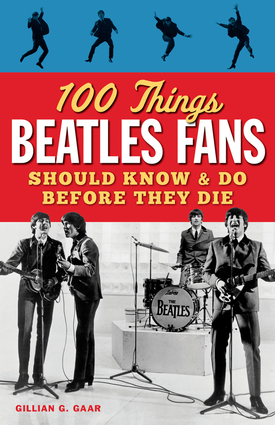 100 Things Beatles Fans Should Know & Do Before They Die was reviewed on Examiner.com. 100 Things Beatles Fans Should Know & Do Before They Die was featured in a giveaway in the Boston Herald. 100 Things Beatles Fans Should Know & Do Before They Die was reviewed by the Houston Press. 100 Things Beatles Fans Should Know & Do Before They Die was featured on Examiner.com, along with an interview with author Gillian Gaar. 100 Things Beatles Fans Should Know & Do Before They Die was reviewed on Caught in the Carousel, an online music magazine. 100 Things Beatles Fans Should Know & Do Before They Die was reviewed on ExpressMilwaukee.com, an alternative weekly newspaper in Milwaukee. 100 Things Beatles Fans Should Know & Do Before They Die was mentioned on Examiner.com, in conjunction with an upcoming author appearance.